Flaxseed is a grain normally grown in northern, cool climates. It is also referred to as flax or linseed. Canada is the leading producer of flax. Flaxseed is one of the few plants containing Omega 3. The fatty acids in omega 3 benefit horses in several ways, improving skin, hair and body condition and reduce stress among them. Flaxseed contains 40% omega 3, about 20% protein and 30% digestible fiber. To maximize digestion of nutrients, flaxseed should be freshly ground at each feeding or a stabilized product used to prevent it from becoming rancid. A maximum of one pound fed per day has shown no adverse effects. But adding any supplement to your horse’s diet should be done gradually, over a week’s time. This will give your horse’s gastrointestinal tract to get used to the addition. Make sure the calcium to phosphorous ratio is balanced. Ground flaxseed is a good addition to your horse’s diet providing calories, fiber and fat. 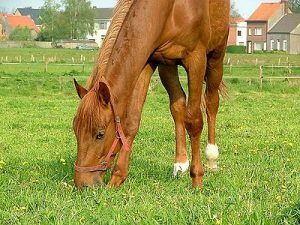 Research into adding flaxseed to your horse’s food is ongoing to determine the further benefits to the immune system.